I’ve spoken to so many grown-ups over the years who think they are ‘not creative’. 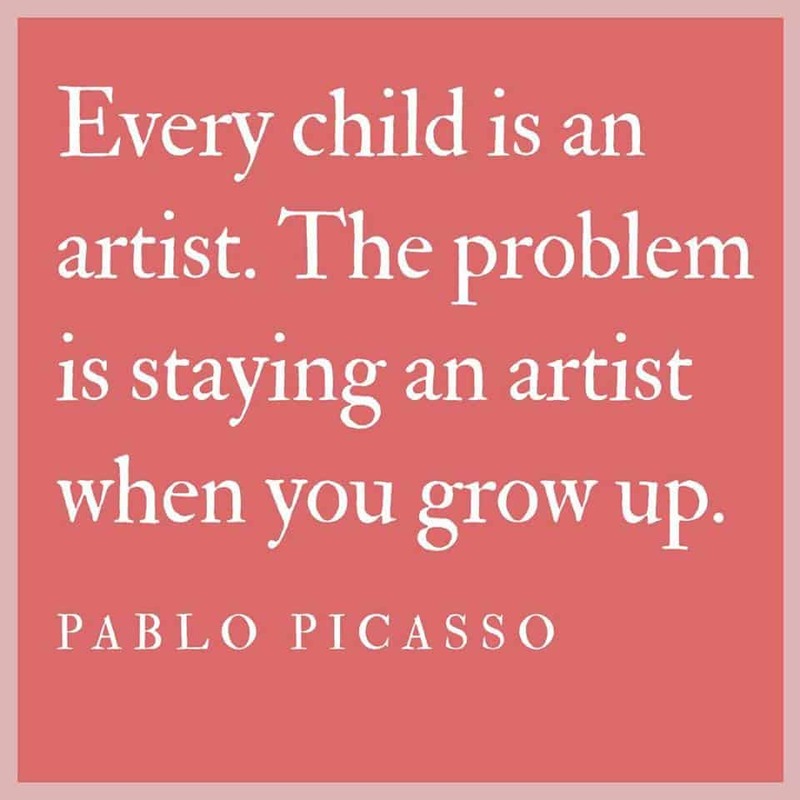 But I totally agree with Picasso. I think we’re all big kids on a continuum of ‘age’ which we pass through. Certain survival skills do need to be achieved (unless you continue to live with your Mum!) But sometimes other expectations can be unhelpful. Sylvia Plath said “The worst enemy to creativity is self-doubt” and isn’t this true? As kids, we are indestructible, infallible. We have no inhibitions, we’re not self-conscious and we definitely only start to acquire self-doubt as we get a little older. So you want to blow bubbles or do cartwheels? Do it while you can! 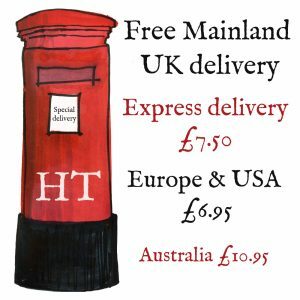 You want to sit down with a pen and paper and have a doodle? Do it! The kids want us to sit down and do some drawing with them but the fear of putting pencil to paper is too great. “It’s definitely not going to look like a dog/dinosaur/poo emoji!” Ditch the expectations and the self-doubt for an hour. It doesn’t matter what it looks like. Because giving it a go is a massive message to kids. As is getting it ‘wrong’ and not being perfect. It’s good for kids to see we are infallible and that it’s ok to make mistakes. So I challenge you! At some point this Easter Holiday, whether you think you can draw or not, sit down with the kids (or alone) and give it a whirl. Sit in front of a bowl of fruit and draw that. Go outside, draw flowers, buildings, birds. Make some marks. Scratch, print and play. 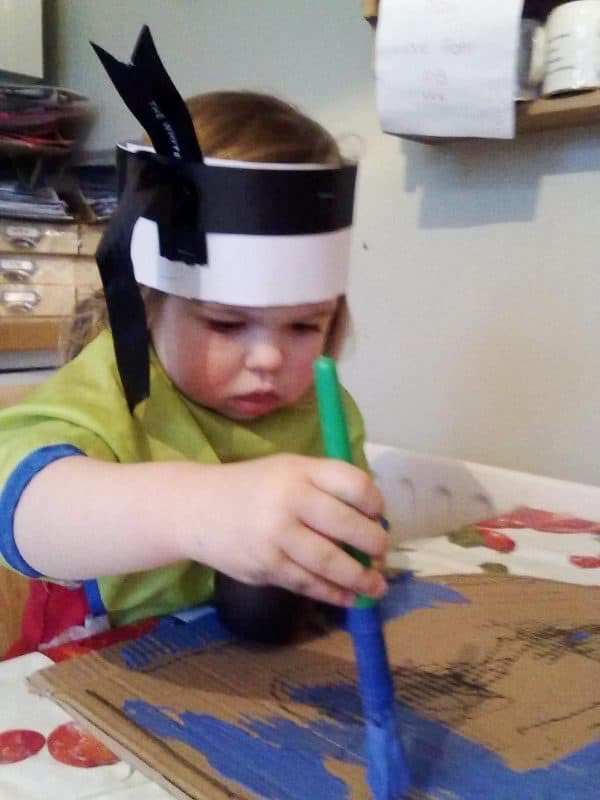 Or draw something from your imagination – doodle and play. Let the pencil run away with itself and see what happens. And most importantly try really hard not to judge yourself. If you hear a voice saying ‘Lordy that’s terrible!’ push it away and say to yourself ‘I enjoyed the process and the more I practice the better I will become’. 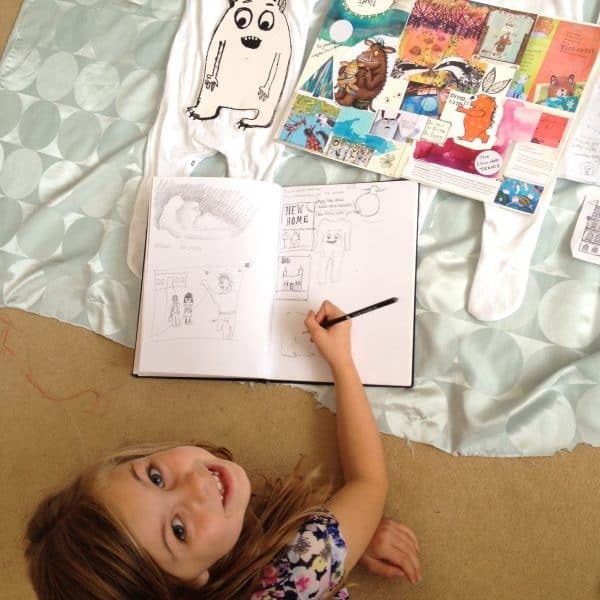 Iris helping me with the “Be Brave” monster designs!